As we move into Labor Day weekend, it is important to reflect on where we are in helping everyone achieve the American dream. Andrew Carnegie believed “you cannot push anyone up a ladder unless he is willing to climb himself.” But, what is that ladder and how do we measure progress toward moving up? While we conceptually understand what self-sufficiency is, it can be tough to articulate. Recently, the nonprofit sector has adopted a tool to bring clarity to this often subjective measurement: the self-sufficiency matrix. The matrix quantifies crisis to stable to thriving states (on a scale similar to the pain scale used in doctors’ offices) across multiple domains linked to self-sufficiency like access to food, housing, healthcare, income and more as well as calculating a total score for the individual or family. For example, a household’s food needs would be considered in-crisis state if it could not afford its food and relied on food pantries for much of what it consumed. Conversely, a family would be considered thriving if it could shop at a place of its choosing, whether a grocery store or restaurant, for the food the family needs to survive. It allows organizations and individuals to look at areas of growth independently, but also at the big picture. We also like it because the domains are fact-based – there is no judgment involved, just a factual understanding of where an individual or family is on the scale. The self-sufficiency matrix sheds insight on how your clients are doing overall and allows you to dig into the details. For example, a residential program for single mothers and their children (also known as a two-generation program) in the Midwest uses a customized matrix at intake, graduation and every year after graduation to measure how its clients are progressing over time. The matrix has helped the organization communicate the progress its graduates make when they leave the program, i.e., from stable to thriving, and that they are able to maintain those levels of self-sufficiency. Using the matrix, the residential program has also found that it may be able to augment support to graduates in areas where they sometimes stumble – for example, debt and emotional health – and has used the data to inform social return on investment analysis. The self-sufficiency matrix can help organizations shed light on issues and root causes that go unrecognized. 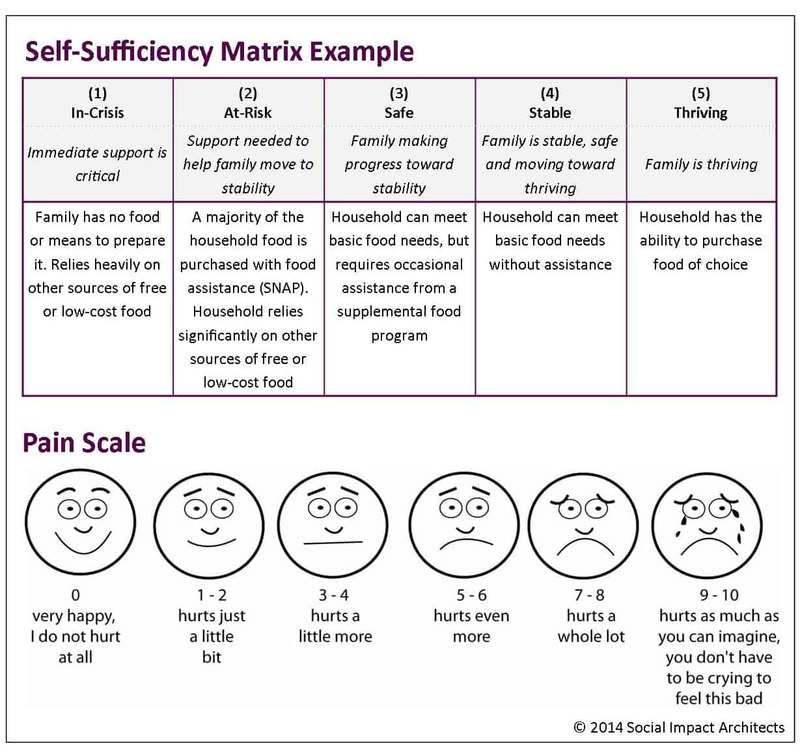 For example, we had a client use a robust self-sufficiency matrix with their teen clients. At first, they questioned whether they should include all the areas in the matrix, since their program didn’t directly impact them all. Ultimately, they decided to do so, because the matrix allowed them to view the whole person and how each individual was doing in specific areas and as a whole. By doing so, they hit the jackpot – in follow-ups with discharged clients, they realized that many struggled with mental health issues. They were able to proactively add partnerships to support these clients and found a significant reduction is relapse rates. The self-sufficiency matrix is a fantastic tool that quantifies a state of well-being that is sometimes difficult to pinpoint. 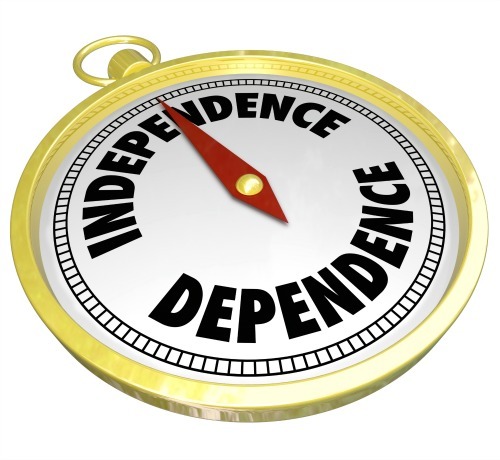 It can help us measure how well our clients are laddering up to greater self-sufficiency and identify issues that may be keeping higher rungs out of their reach. We hope you will consider using the matrix in your program evaluation and, for those who are already using the matrix, we invite you to share your lessons learned.